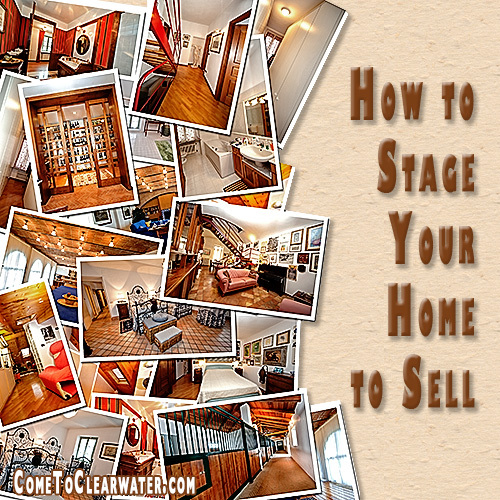 Stage your home if you want to sell it faster and for more money. Ask any Realtor and they will tell you that staged homes do sell faster and for more money than homes that aren’t staged. If you want to sell your home, stage it. Here are some tips. First and always, declutter and repair! Take the time to pack up now, and put the majority of your belongings into storage. Keep only what you need to live for a few weeks. Then make a rule, for every one thing you bring into your home, one thing has to leave. Less is more. Take the furniture you have left after thinning it out, and group them to make the space look larger. Put sofas and chairs into cozy conversational groups. Place furniture so that there is a definite traffic flow. Use furniture pieces in different places in your home. Put an armchair in the bedroom to make a cozy sitting area or use your dining room table, without the extra leaves, under a window as a writing desk or library table. Think out of the box to sell your home. Make that junk room into a room with a purpose. Use that unused furniture to make it into an office. Make each room have a purpose to add value to your home. Odd rooms or unused space that makes no sense will make buyers look elsewhere. Make sure rooms are well lit, either naturally or with lamps. This also makes them look larger and more inviting. Paint. Freshen up rooms with paint. A small room can look larger if you paint it the same color as an adjacent room. Choose colors that are neutral and inviting. Neutral doesn’t have to mean white; it could be tan or light blue. Look for calming colors. You should hang things on the wall, but not photos. Depersonalize as much as possible, but also place paintings or art in places that are not “usual” to get them noticed. Place things on tables in living areas to make them inviting as well. Use a “group in three” rule. Odd numbers when accessorizing are preferable, but don’t line them up, vary scale and group in a triangle or some other shape. Group by color, shape, texture or some other unifying element. Use the beauty of nature in it as well. Raid your yard for flowers or foliage to bring in some natural beauty. Staging your home is not really an option when selling your home. Ask your Realtor for some guidance, and then get ready to sell your home!